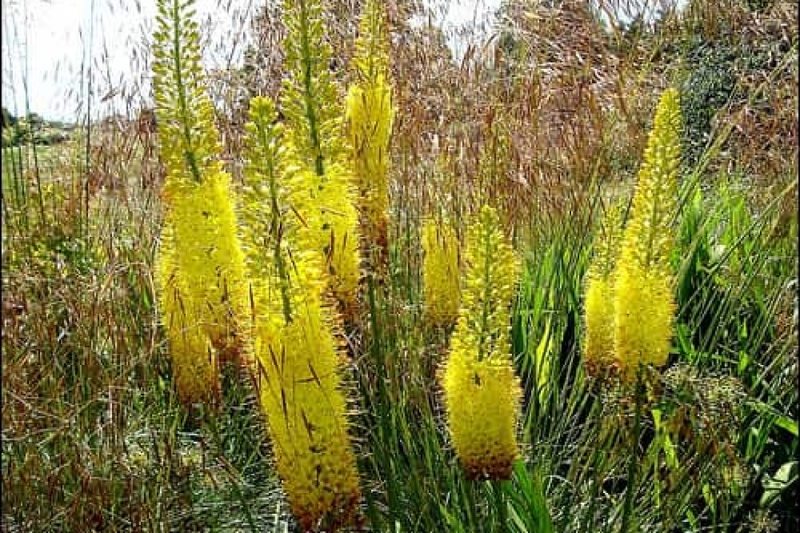 Foxtail Lilies (Eremurus): growing, planting, caring. Eremurus - The foxtail lilies or desert candles - is a genus of deciduous perennial flowers, native to eastern Europe. The inflorescence is a long spike, like a bottlebrush, consisting of many flowers in copper, bright yellow, snow white, pastel pink, orange or any combination of those colors. It grows tall, sometimes rising up to 10 feet over the foliage, depending on the variety. Eremurus enjoys a good sunshine. It is resistant to drought. Place it in a soil rich, fresh but well drained, without excessive winter humidity because it does not support stagnant water. Work the soil to a depth corresponding to a spade head. Plant without burying too much the central bud. Tamp enough around the roots without breaking them. Water abundantly to help rooting. You can plant the Eremurus in a large pot filled with a mixture of sand, loam and compost. The first month water regularly if you have planted in the spring. Water when the top of the soil has dried. In the open ground, beyond the first month, watering is only necessary in case of prolonged drought, or for plants in vats. The first winter after planting, the bud of Eremurus is fragile, so remember to protect it with an inverted pot or mulch. Bring fertilizer at the foot of the eremurus like compost or ripe manure. In pots, pour a liquid fertilizer regularly - ore even better, compost juice. When the stems are dry at the end of the season, cut them off.